Bus tour starts at 8PM each evening from Av San Martín between calle 4 and 5 in BocaGrande. The tour runs 3 -4 hours before dropping everyone off at a discotheque. This is not your ordinary city bus tour. 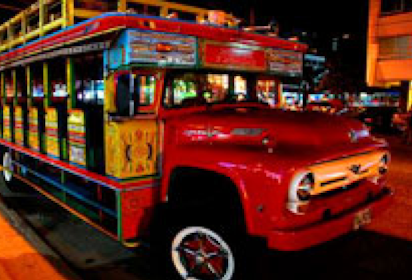 The Vallenato chiva bus tour starts at 8 p.m. each evening from Av San Martín between calle 4 and 5 in BocaGrande and travels around the Cartagena's historic city. The brightly colored chiva bus is basically a discotheque on wheels, and throughout the tour drinks are served and a local vallenato band plays live aboard the bus. Vallenato music is a musical genre which traces its roots to the Caribbean Coast, and specifically Valledupar. The musical instruments themselves all trace their lineage to different cultures: the accordion to Europe, the caja to Africa, and the guacharaca to the indigenous Indian tribes. Even if you hate the music (which you might) you will appreciate how the instruments, like the cultures which produced them, meld together to play together as one. The tour runs 3 -4 hours before dropping all remaining passengers off at a nightclub. Copyright © 2010-2019 · Propertyshelf · All rights reserved.